If I were writing a value statement for equity, I would say: We believe that creating equity for all is the responsibility of all. Living the value of equity promotes understanding, fairness, acceptance, and action. 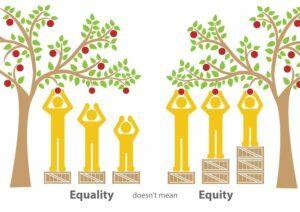 As equity is often confused with equality, it is worth defining both words. Per Merriam-Webster, the definition of equity is justice according to natural law or right. Specifically: freedom from bias or favoritism. Equality is defined as the quality or state of being equal. The value statement declares that everyone is responsible for equity. This implies a sense of social justice. Equity and Social Justice, as concepts, are near synonyms. We are all a part of the problem and the solution. It takes personal courage and thoughtful, intentional action to overcome barriers created by ignorance. As with all the values we discussed this year, we can apply it to our personal lives, our Junior League community, and to our social institutions. Equity in our personal lives begs for inclusiveness, which, in turn, requires an openness of heart and a willingness to see others’ similarities more than their differences. This can start in our neighborhoods and our work places by getting to know the people in front of us. Invite people over for coffee or out for a drink. Find out where they need help and do your best to meet that need appropriately. These are not grand gestures of social justice, but it’s a beginning. It’s important to genuinely be a good neighbor. In Junior League we are advocates of equity on many levels. We concern ourselves with equity in gaining access to services for economically challenged families in Alameda and Contra Costa Counties. We consider and promote laws that affect systematic social equity in education, violence prevention, family support, and human trafficking. We support diversity and inclusion in our league programs and endeavor to create equitable access to membership for all women. We work with partners that seek to overcome obstacles to housing, clothing, jobs, and food for those in adverse circumstances. By engaging in League work, you are practicing equity in your county and state. On a larger scale, you can choose to live in a way that supports equity and influences the institutions that surround us. Some actions that affect equity are: voting on policies that affect challenged people groups, donating to causes promoting equity, and voting with your dollar by purchasing fair trade goods from socially responsible businesses or corporations. These methods can move our culture toward institutional equity. In closing, I’d like to recap why I’ve been talking about values all year. Values are the basis of decisions. They define one’s work and work ethic. They motivate one to do well and influence priorities. The Junior League values serve as touchstones for our work. When we are in doubt, we turn to them and reflect on their relevance and application to our challenges. Values shape our vision and are the foundation of our strategy. I hope that throughout the year you have taken the discussions to heart and applied the values to your own league efforts.